This April, Level-5 will holding its own expo in Japan and will announce a handful of new titles. The event's official site lists the event outline, which includes Yokai Watch 3, Layton 7, and Fantasy Life 2. Level-5 will also detail future anime projects. This sounds like big news all around. Yokai Watch has become incredibly popular in Japan, so a new entry isn't a surprise. It's always good to see a new Layton game, and the same can be said about a Fantasy Life sequel. 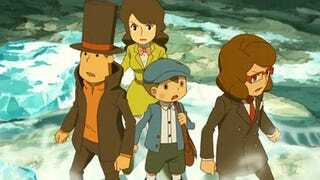 Layton 7 was first announced in 2013 for Android, iOS, and 3DS. The puzzle game appeared to be the first to ditch the professor; however, the game has been M.I.A. since then. On the event page, Level-5 is listing Layton 7 as one of the "newest works" that will be presented. There is no other information at this time. There&apos;s a New Layton Game. It&apos;s...Different. So yeah, that's pretty much all we know for now. The expo will be held on April 7 at Tokyo Dome City. Until then!